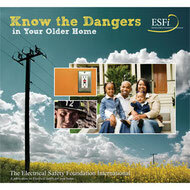 Know the Dangers in your Older Home - Purdy Electric Co., Inc. - All types of electrical work! Know the Dangers in your Older Home provides facts, statistics, and tools to educate people everywhere about the electrical dangers commonly found in older homes. This booklet introduces new enhanced technology that can protect your family from injury and your home from fire. Features a user-friendly checklist that can be used as a guide to help you to identify electrical hazards in and around your home. Click on the image to download the booklet, or visit esfi.org for more information.